On Thursday night of the IAMPETH Convention, there was a program open to anyone who wanted to participate called “Instant Originals.” Each participant created an original piece in full view of conference attendees who could then ask questions about technique, tools, anything to do with the lettering arts. They saw Rosemary Buczek draw, paint, and gild a capital “P.” They saw John DeCollibus render a bird and ornamental penmanship. Several others created pieces and all were donated to the silent auction, a major fund raiser for IAMPETH. Testing the flexibility of a nib. 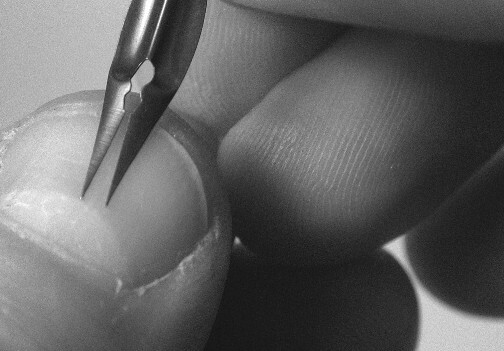 Press a nib against your thumbnail using the pressure that you would use to create a shade (thick line). Note how the tines spread. Is it comfortable for your style of writing? One of the attendees, having seen John DeCollibus work his magic with a pen, came over to me and asked where he could buy Gillott Principality nibs. (I had given a lecture on nibs earlier in the week.) I replied that the Gillott #1, the Principality, is probably the most sought after nib in existence and considered by many, particularly those who do ornamental penmanship, to be the finest nib ever made. It is very sharp, extremely flexible, while delivering ultra-thin hairlines and thickest shades. These attributes made it the first choice of many past master penmen such as Francis Courtney and Louis Madarasz. However, they are very rare, and if one is fortunate enough to find some, they will be very expensive. 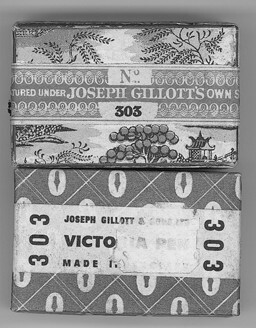 Around 1920, Gillott changed the box for the 303 nib. That signalled a change in the nib. The top box, the classic Blue Willow design, is circa 1900. The Victoria Pen box below with remnants of a store price tag (a gross sold for $1.50-2.00) circa 1930. The bottom box held 100 pens. As far as it went, my answer was correct, but did the questioner a major disservice. A better response would have been to ask what kind of script he did. I could then have directed him to a more available penpoint perhaps more suited to his needs. In coming issues, I will discuss nibs, both old and new, and attempt to place them into categories according to their sharpness and flexibility. Not only should this help IAMPETH members find the right nib for their type of work, but also help them to make reasonable buying decisions. 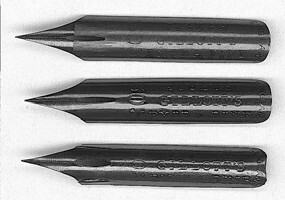 Certain well known vintage nibs useful for ornamental penmanship or copperplate/engrossers’ script (think several Gillott and Spencerian pens for starters) are popular and costly, but there may be other pens of similar sharpness and flexibility that are not so expensive. These nib surveys will probably be ongoing for some time for there were literally thousands of different makes and models manufactured during the Golden Age of Penmanship, 1840-1940. It will be impossible to cover all in the first pass. Inevitably, there will be some good pens omitted. All IAMPETH members are invited to inform me of a pen that wasn’t included. If a nib can be spared for evaluation, please send it. My e-mail and snail-mail addresses are on the inside front cover. There is no source of nib information of this type and the IAMPETH Newsletter is a good place to start. Every nib we review will only add to our organization’s knowledge. Though the universe of vintage nibs is shrinking, they do show up on Ebay and through private sales. Nobody is throwing them out, which is good for us. Patience is needed, but there are still good vintage nibs out there. For many penmen, evaluating a nib is still a mystery. Here, we will try to cut through the fog. The top nib below is circa 1900 from the Blue Willow box. Second is the far more flexible 303 from the Victoria Pen box. At the bottom is a modern 303, similar in flex to the 1900 version. Both are bronze colored. Modern 303s are blue. Too many penmen, especially beginners, get caught up in what I call the Great Nib Hunt. They will spend $200 and more (sometimes much more!) on Ebay for a gross of Spencerian #1s, Gillott 303s or Esterbrook 128s only to discover when they get the box and try the nib, it is totally unsuitable to their style of writing. They bought the nib because they had seen a top penman use one at a workshop or conference. 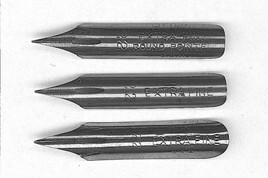 The attributes of the nib—sharpness and flexibility in relation to their own writing style—wrongly became secondary considerations. It is like the young baseball player who wants to use the same type of bat Babe Ruth did. That bat would not guarantee 700 home runs any more than a Principality would guarantee Madarasz-like script. Sometimes it is the nib that chooses the penman. In today’s age where formal instruction in penmanship is virtually impossible to find, those interested in script are forced to find their own path and style. Each hand is different. The amount of pressure one is willing (or not willing) to use on the pen dictates style. Light hairlines, heavy shading, and desired letterforms are a product of one’s taste. Three generations of Hunt 22s. The top pen, Extra Fine Round Pointed, is circa 1915 and from the top box. The middle nib, still Extra Fine, but not Round Pointed, is from the right box. At bottom is a modern Hunt 22. All are bronze. Nib selection may also be determined by other factors. If you were suddenly faced with the prospect of writing a lot of copy in a constricted space, you may have to consider a finer nib so you can write smaller. Paper may also play a big role in choosing a nib. Paper that does not hold ink well may require a finer nib to obtain a decent hairline. Textured paper usually snags sharp, extra fine point without mercy. A less sharp nib generally works better. I like to have a variety of nibs on hand for any eventuality. A study of suitable nibs touches on a recurrent theme in the IAMPETH Newsletter: What do you want your work to look like? Copperplate and engrossers’ script aficionados may look at the sharpness and flexibility of a nib differently from those who prefer ornamental penmanship. Some may prefer another nib for offhand flourishing. It’s all a matter of comfort and taste. If one prefers super-light hairlines and heavy shades, an extra fine, super flexible nib is the one. A fine, less flexible nib will produce thicker hairlines and less shading. Those who prefer business penmanship will find a host of stiff vintage nibs ranging from extra fine to a much thicker point. Indeed, probably 98 nib models out of 100 will fit this latter category. These were nibs used in schools and offices by students, clerks, bookkeepers, and more. They were the pens used to write a letter. You see a box of Gillott 303s on Ebay. You are familiar with the nib and may even own some. It is flexible and very fine. Typically, this box will go for more than $200 before bidding is done. In bidding your hard earned money you assume that the nib has been consistently manufactured by Gillott during the pen’s nearly century and a half of existence. Not true! Gillott 303s, prior to World War I, were very fine and quite flexible. However, after the war, the pen underwent a radical design change. Between the world wars, the 303, now called the Victoria Pen, was extremely fine and super flexible, a major departure from the earlier nib. While both are terrific nibs, certain scribes will find the younger pen much more difficult to use. It requires a far lighter touch or it will surely snag in the paper fibers. Its flexibility is comparable to a Principality or Gillott 604EF. The older 303 is more like the Spencerian #1. All are great nibs, but there are significant differences. After World War II, Gillott went back to the earliest design and colored it blue. The present nib is still good, but much different than the 1920s and ‘30s version. A buyer needs to be aware of the differences and purchase according to taste. The Gillott 303 is not the only pen to be redesigned during its life. The Spencerian #1 also changed after World War I. The postwar point is not as sharp and, in my opinion, manufacturing standards suffered. Spencerian Pens were made by Perry in England and post World War I was the beginning of the company’s decline that would be complete after the Second World War. Spencerian #1s were generally found in the blue box with the yellow band in the 1920s and ‘30s. Prior to that, the nibs came in a flowered box with a blue band, although I have found some in the old box. Two versions of the venerated Spencerian #1. The lower nib was made in England by Perry & Sons. The top nib is circa 1925 and is somewhat different than its older counterpart (ca. 1900) at bottom. The main difference is the point; the younger pen is not as sharp, though flex is similar. One can see the differences in nibs by the serif at the top of the “1” in the younger nib. Also, the 1920s version does not say “Made in England.” There is a Perry-Spencerian Pen Company contract in the archives of the city of Birmingham, England that designates Perry as the maker of the American company’s pens until 1939. Hunt 22s also underwent a change at about the same time. The earliest version, billing itself as Extra Fine Round Pointed, and is more flexible than its Extra Fine (no Round Pointed) successor. IAMPETH members I have spoken with about the two versions are unanimous in preferring the older nib. While I don’t disagree, the younger pen is quite usable. Still manufactured today, the modern Hunt 22 is like the latter non-Round Pointed pen. These are three nibs that I know underwent a change in their lives and IAMPETH members are the better for knowing about them. As more information about other nibs comes to my attention, I will pass it along.